The forecast was for another day in the mid 90s. Our northern Minnesota blood was too thick for the heat. Sylvia, our AirBnB hostess, had just the answer. 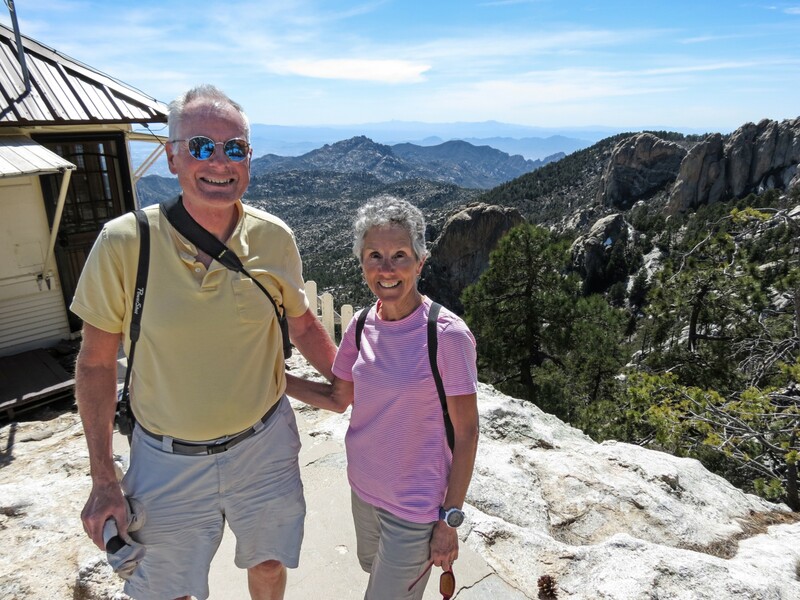 “Have you been to Mount Lemmon? It’s always 30 degrees cooler up there.” That’s all we needed to hear. It was also on my left-over wanna see list from last year’s stay in Tucson. 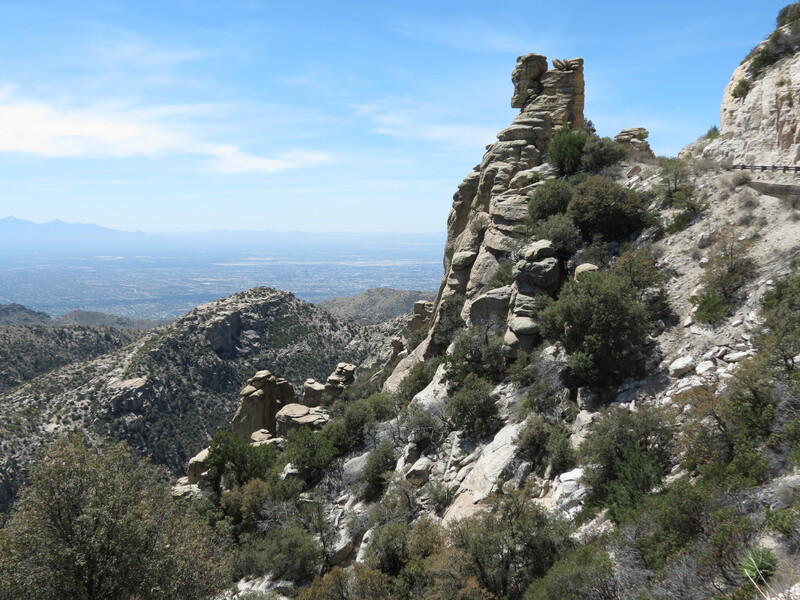 At 9,100 feet, Mount Lemmon is the highest peak in the Santa Catalina Mountains, the same range we’ve been admiring from our patio all week long. 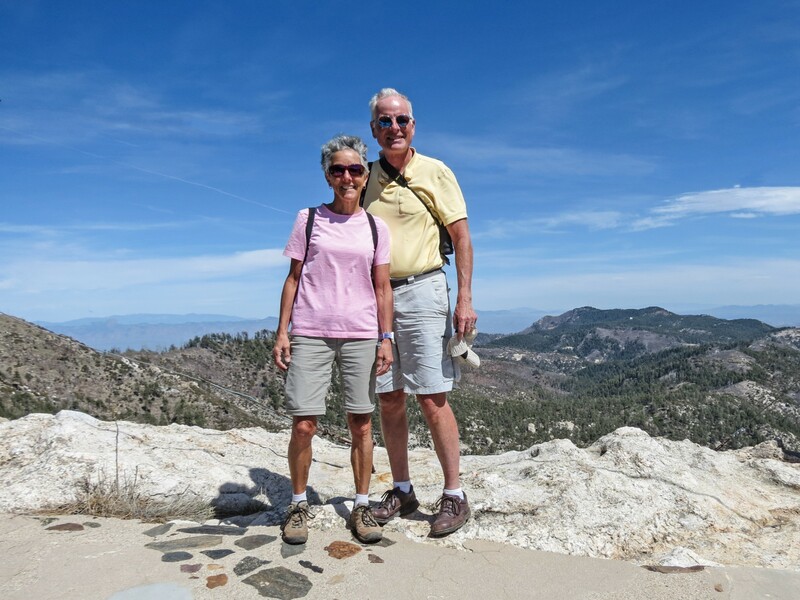 It boasts a ski hill at the top, so there is a good paved road and a small community called Summerhaven near the summit. We crossed town to reach the start of the Sky Island Scenic Byway. I settled in to enjoy the ride, as the 27-mile journey is an attraction in itself. 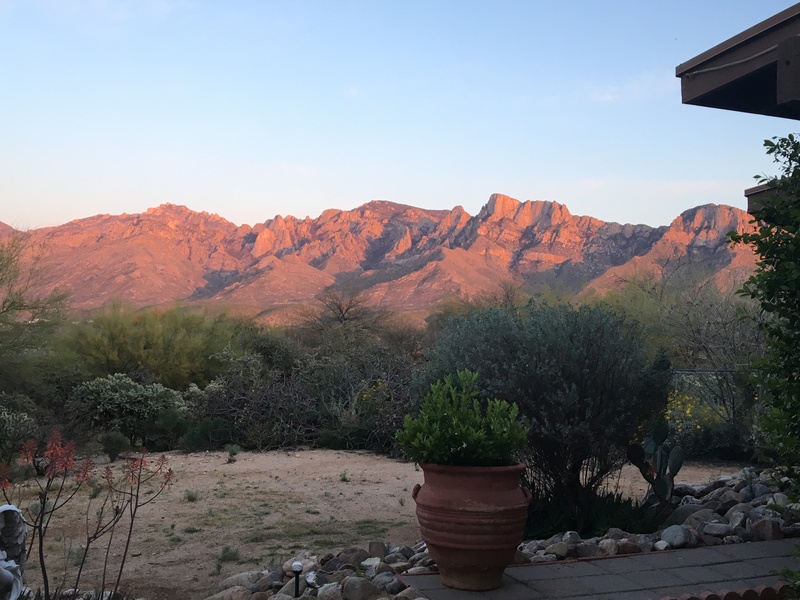 We started out in the now-familiar Sonoran Desert environment, surrounded by cacti and scrub brush. As we rose, saguaro and a sea of yellow wildflowers took over the landscape. 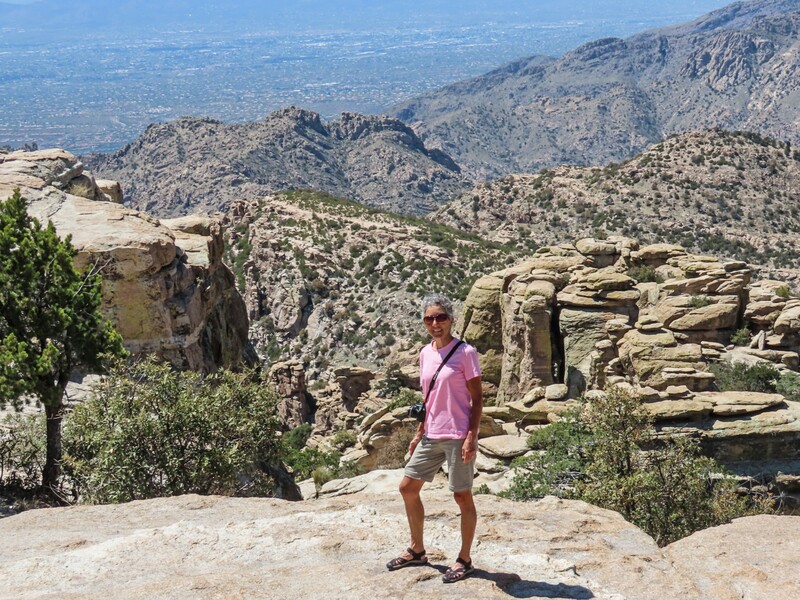 The city of Tucson dropped below us, a miniature playset of streets and buildings just visible over the edge of the cliff. Fortunately, there were frequent pull-outs for safe gazing. Each curve delivered new scenery. 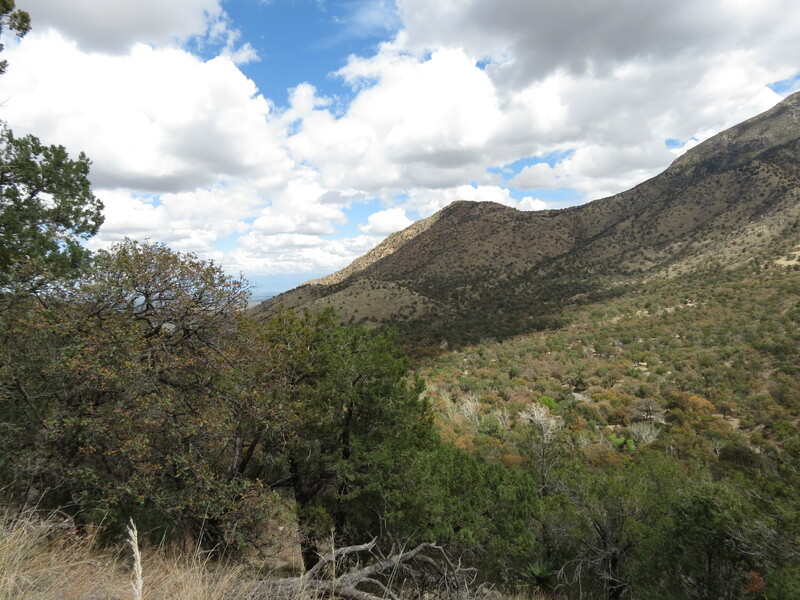 Saguaro giants gave way to real forest, with Aspens and Ponderosa Pines looming overhead. Wildflowers changed suit as well. 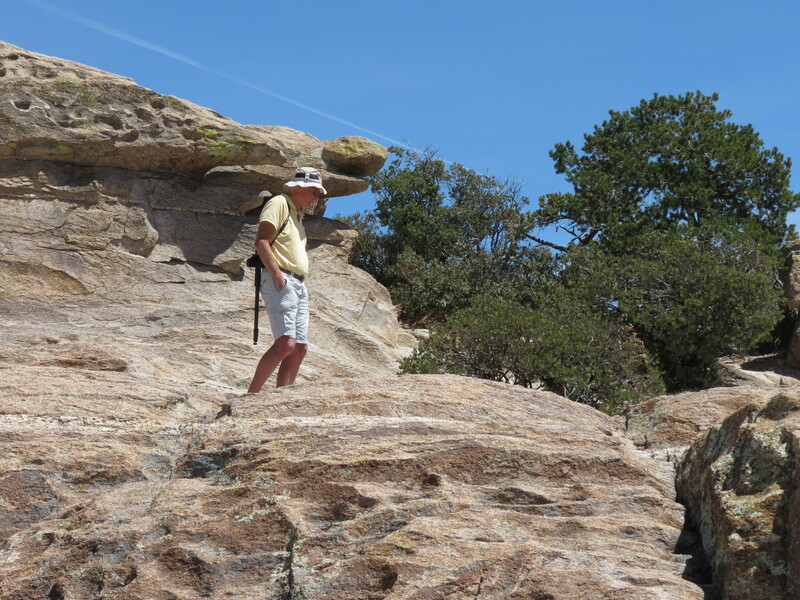 But it was the rock formations that demanded my attention, and added a new term to my vocabulary. “Hoodoos.” Tall thin columns of weather-beaten rocks stood at attention on the slopes as we navigated the switchbacks. At Windy Point, I just had to get out and mingle with these giants. Numerous other visitors populated this stopping point, clambering up rocky promontories for pictures and posing for selfies. 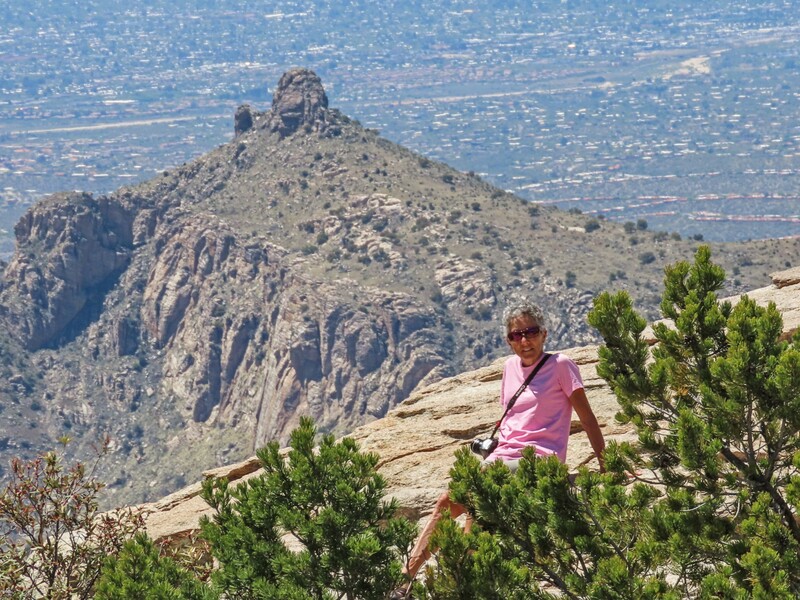 I enjoyed the same views and poses from safer flat rocks. And there was no mistaking the refreshing breezes that cooled the higher air. A pool of cyclists congregated at this vista as well. The byway is a popular challenge for cyclists, and by this point the intrepid athletes had already climbed 18 miles and 3,600 feet. We would continue to see bicycles all the way up and down the mountain. Never once did we wish ourselves in their seat! Near the summit, we continued on past Summerhaven and beyond the ski hill to reach the very end of the road and a trail head. Those last few cliff hanging miles justified the 10 mph speed limit. Itching to get out and experience the mountain up close, I insisted on a hike. Sylvia was right, the car thermometer registered 64 degrees, and we each donned an extra layer before setting off. 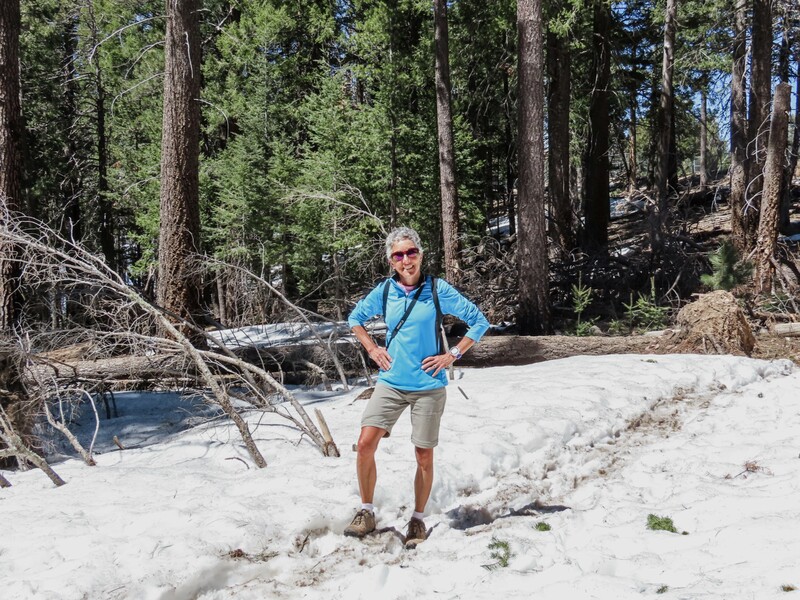 Left over snow was not confined to the ski hill, as we traversed thick patches on our trek. We felt right at home in the pine forest. 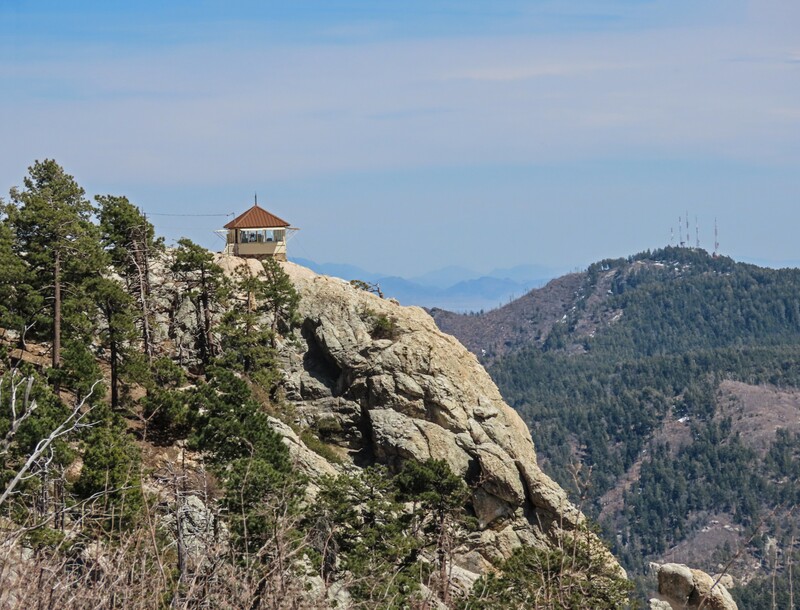 We noticed the lookout tower in the distance, but it took a fellow hiker to entice us down another path to take in its views. The wind whipped around us as we stood on the rocky promontory. The trip back down the mountain let us view the whole scene in reverse. Cyclists continued to struggle up and whiz down, even as the afternoon waned. The temperature rose in reverse proportion to our elevation, but we had successfully missed the peak heat of the day. Instead we had a delightful Minnesota type day, chilling out on the mountain. Reaching the top trailhead, we headed up the Carrie Nation Trail. Yes, it followed a stream. 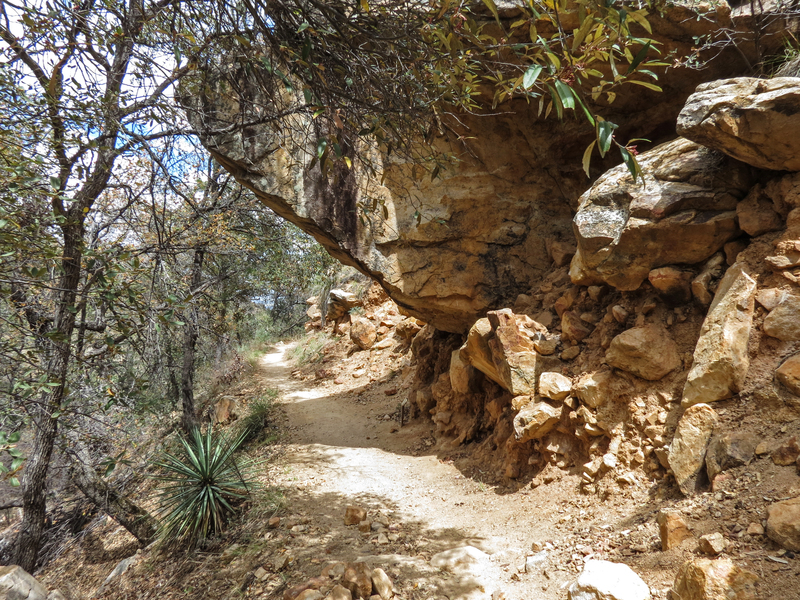 I tried to ignore the huffing and puffing behind me as I forged upward on the trail. And then I heard it. “I think I’m nearing my limit.” He didn’t say he was done yet, so I kept going. Suddenly Rich’s legs gained new strength. He strode purposefully past me with a burst of energy. He was on a mission. I could barely keep up. 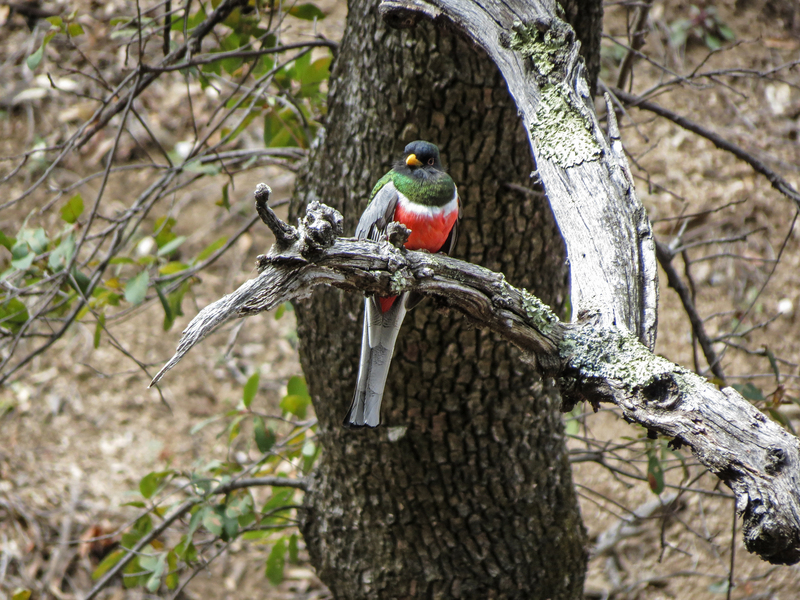 The Elegant Trogon has been in Rich’s sights for two years now. 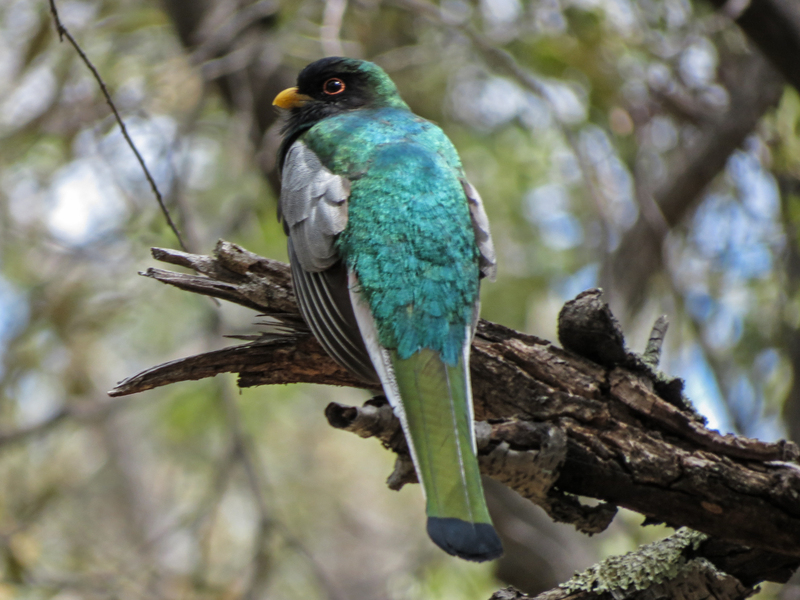 The brilliant tropical bird’s range only barely reaches into far southern Arizona, Medera Canyon included. 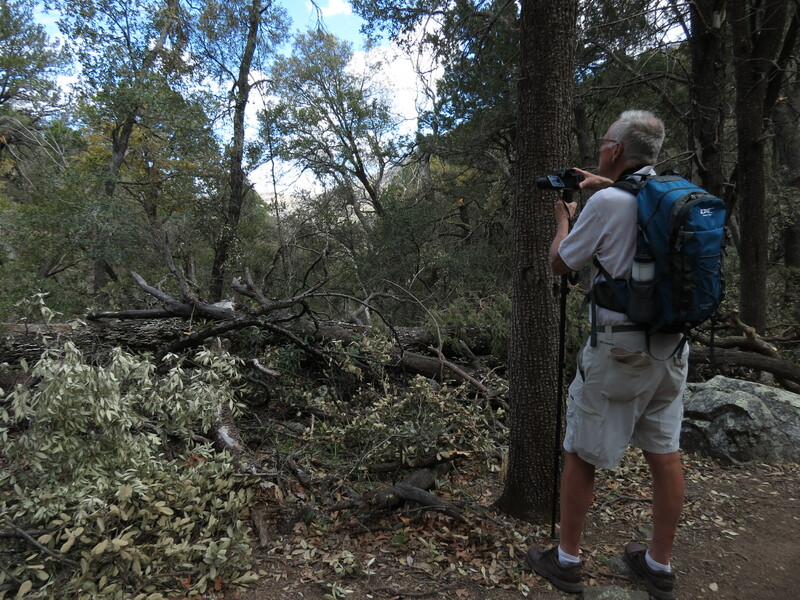 Last year’s visit to this canyon was too early in the season and proved fruitless. Last week’s visit was better timing, but also came up empty. This trail is not where the bird had been sighted. Rich wasn’t even looking for it. But he smelled victory. 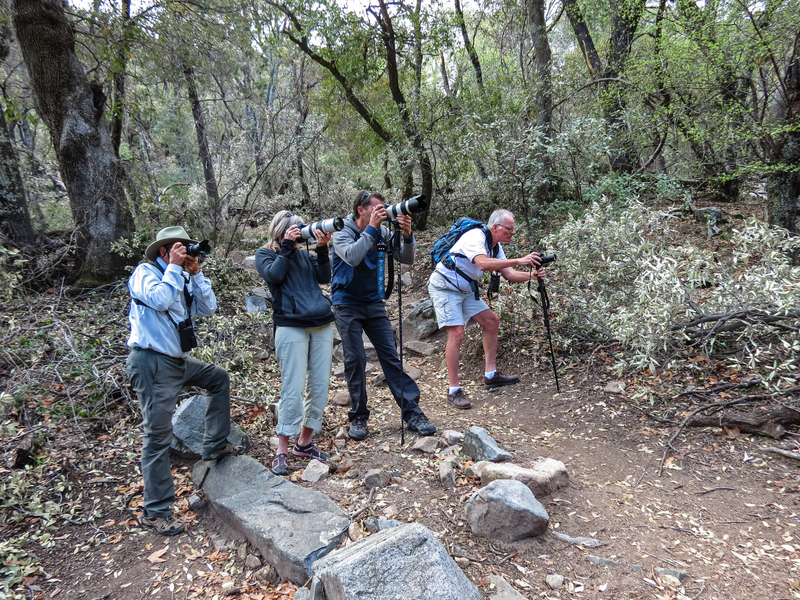 We soon ran into a handful of other birders toting cameras with obscenely long lenses. They had already seen and photographed the elusive bird, and were hoping for another glimpse, more photographs. Rich eagerly joined the little enclave, whispering, pointing, gesticulating and searching. I did my best to melt into the background. To remain silent and motionless, lest I spook the very bird they sought. Tiring of the hushed drama, I left them to their hunt and continued up the trail. We were here to hike, remember? The trail petered out sooner than I expected, so I reluctantly turned around. I found Rich and the pack further downstream than where I had left them. But they didn’t notice me. All cameras were trained on The Bird. Lenses pointed and shutters clicked incessantly. Arms stretch out and fingers silently pointed when the bird moved. Photographers shifted accordingly. New vantage points, more photographs. And still I was blind to the subject that took over the souls of these intrepid birders. All I saw was trees and leaves. The hunt slowed temporarily and Rich took in the fact that I was there. “Have you seen it?” he asked excitedly. I shook my head. I didn’t even know what the bird looked like. With hundreds of images already safely saved to the memory disks on their cameras, Rich and the photographers eased up a bit. Rich pointed out the bird, and I finally focused in on its brilliant red breast, the luminescent green glow of the feathers on its back. Despite my firm stand that I am not a birder, would never be a birder, I couldn’t help but appreciate the beauty of this particular specimen. The solitary bird toyed with these camera toting devotees all the way back down the trail. He flitted from tree to tree, never too far to disappear from sight. Even I got the hang of glimpsing the red breast as he took flight and following it to his next perch. The camaraderie of the little group grew as we inched our way along, and they even drew me into their huddle to make sure I could see the bird’s latest landing. Having nothing else to do, I succumbed to the impulse to remove the lens cap from my own camera, hunker down to steady my zoom lens and click the shutter. Oh cool, I got him! I tried again. And again. By the time we reached the trailhead, Rich was bursting with excitement. 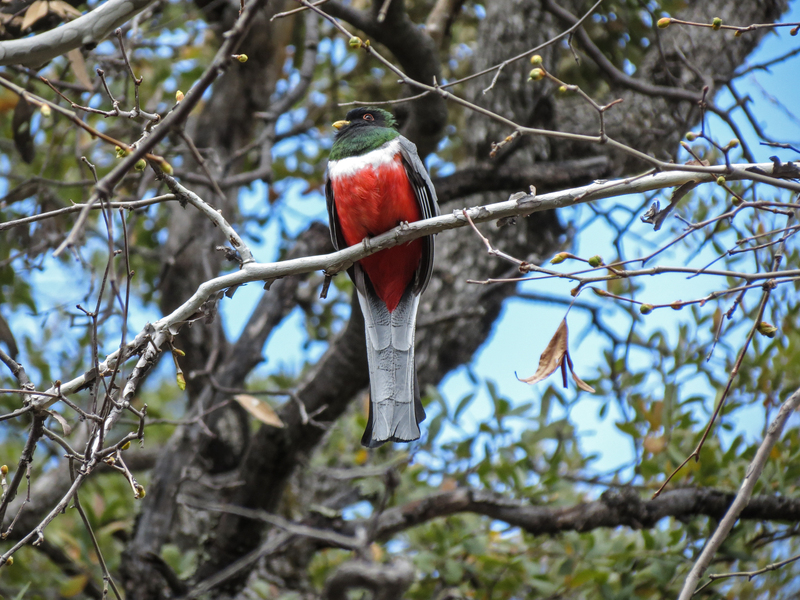 And gratitude for my patience while he pursued the Elegant Trogon. So I seized the opportunity. “That’s okay. You can keep birding. While I take the Nature Trail back down to the car.” I was happy for him. But I still had some hiking to do.